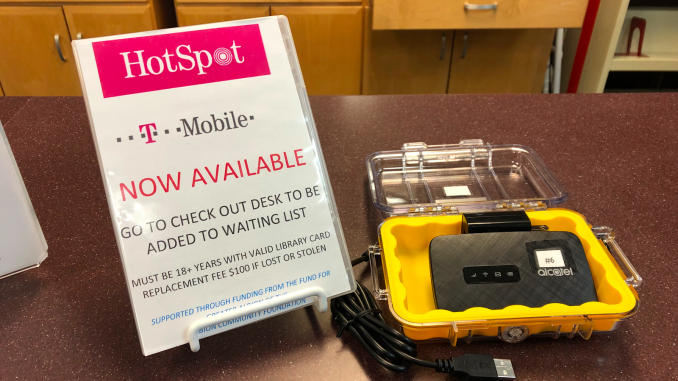 In 2018, the Albion District Library was granted $4,000 worth of funding for five mobile Wi-Fi hotspots by the Albion Community Foundation. Four hotspots are available for check out, while one hotspot is reserved for library staff use. The hotspots will allow anyone with an Albion District Library card to access 4G internet at home or on the go. Cindy Stanczak, the ADL director, reached out to the Albion Community Foundation to request mobile Wi-Fi hotspots after observing how they worked in nearby communities like Marshall, Jackson and East Lansing. Libraries in these areas implemented mobile hotspot units and observed a high check-out rate. “Part of what public libraries do is try to provide equity and access to information to all people regardless of their social background and means,” said Stanczak. In this current day and age, access to the internet is practically a necessity. Without internet access, it can be difficult to search for jobs, print out government forms or even complete school work. Krause pointed out that many people in the community work odd hours or multiple jobs, making it difficult to rely on the ADL’s computers alone for internet. Recognizing these issues made Krause’s decision to help Stanczak with the hotspot project easy. “If after two years, she finds [that], ‘Wow, there is a waiting list of at least five people all the time. Maybe we need to add more,’ she can say, ‘I have the data to prove this is actually useful,’” said Krause. A main concern for Stanczak is accessibility. Despite a press release about the hotspots and word-of-mouth communications, she worries many people who don’t have access to the internet will not hear about the hotspots and will not take advantage of the opportunity. “There’s this gap of people who may, perhaps, need some of the services that are being provided or would enjoy events that are being offered but aren’t getting the news of it,” Stanczak said about access to library information. Hotspots are available for check out just like a book and can be taken out for up to two weeks at a time. Once two weeks are over, the Wi-Fi hotspot shuts off automatically, ensuring the next person on the waiting list is able to get it on time. Additionally, the ADL has extended its hours to Mondays through Thursdays, 9 a.m. to 8 p.m. and Saturdays from 10 a.m. to 5 p.m.